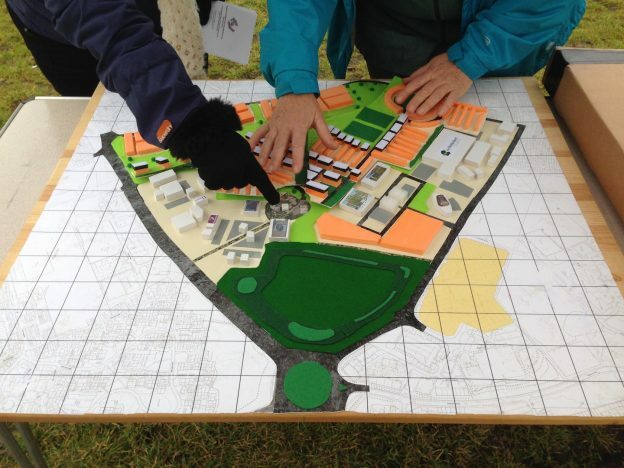 I’ve been working with a local neighbourhood housing forum, using play to help engage local residents in a ‘reg 14 consultation’ on a large housing development. The housing is being built on a large park, which was formally an airport so both the current and former uses have deep play links. as a hook- to draw people in to talk to us, it is an unusual object on the street, yet a familiar image in the collective memory of the area. as a recording device. People can respond to the planning proposals by writing on the plane in chalk. The can also use ‘heart’ pins to show activities on the park they love. as a heritage tool. The space to be developed was an airport and people have very fond memories of it. to solidify the ‘brand’. It is important to be clear to residents, who the group is- a local, voluntary forum, not the local Council. The council and the forum are each consulting on different proposals for the same space, at the same time so clarity is key, as is the message that there is an alternative proposal to the one being offered, and well publicised by the council. The forum’s logo was drawn by local school children, so they already have a DIY, playful, local feel to their brand. A cartoon style, slightly irreverently shaped plane helped to add to this feel and make the forum approachable. to connect with a wider age range. The plane has allowed us to engage many many children in the consultation in a way that formal consultation would not have been possible. In turn this has engaged their parents and empowered young people to use thier voice and be counted. We have also found that older residents enjoy the playful aspect and again, the plane links to their living memory of the airport. We have toured the plane to several sites in Hengrove and Whitchurch- the car boot sale, the play-park, the local civic centre and a school. The plane caught attention each time and together we learnt how to most effectively engage people in discussion, using the variety of tools we had. I interviewed people with my Zoom h4n recorder. As a professional looking bit of kit, respondents played along with ‘being interviewed’. We tried out other play tools on the street, such as playmobile illustrating activities and pins to point out what was particularly important to you. Alongside the plane we used a model illustrating the two different proposals. This is a relatively common tool in planning consultation, but I was taken by how playful it was. It immediately showed people the impact of the house building and the contrast between proposals. It linked into model making, toy trains and dolls houses, and the colours helped to illustrate. I was impressed how much people connected to the model. At a schools session I asked ‘what are we looking at?” and one girl said “home”. We ran two sets of sessions at a local school. Beginning with the model and the childrens understanding of the forthcoming development, we talked about how we used the park- how we played and how we travelled across it. I was struck by the specific impact housing had on the children. One housing plan had a great deal of housing very close to the play park- children complained that it would make it more difficult to get to the park. They were aware that the street would be open, but the idea of walking through the housing was unattractive, to some even threatening. They also voiced concerns about the play-park being closed more regularly during the development. Another consideration is the impact residential housing so close to the local skate park. Could the skate park be forced to move, much as inner city music venues are threatened be new housing close-by? The children each wrote a message on paper, to be delivered as part of the consultation. We transformed the paper into aeroplanes and flew them into our engagement plane. The physical action of contributing our thoughts and ideas to such a major change in the local landscape felt very powerful. This work is contributing to an ongoing study into play in housing campaigning and I will continue to update on what I’m experiencing and learning on these pages. Thanks for taking the time to read this. Images by Malcolm Hamilton with kind permission of the people of Whitchurch and Hengrove, plane built by Kerry Russell at In Bristol Studios.